Big hearted Former Australian test fast bowler, who represented Australia between 1985 and 1994 in 53 Test matches, taking 212 wickets. Merv Also Played 33 One Day Internationals. He took a hat trick in a Test against the West Indies at the WACA in 1988-89, and his cricketing antics are infamous and can be recalled by most who saw BIG Merv steaming in. Merv has been a national test selector, reality TV star, radio and TV commentator and now hosts his very own national fishing show. His love for cricket has been surpassed for his passion for fishing since retiring, all styles and all types. 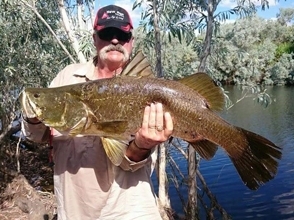 Merv's cricketing career has taken him all over Australia and during those tours he spent his days off exploring all the waterways those states had to offer. Merv Hughes fishing is a light hearted show with some ripping catches, a few yarns (mostly true) mateship and of course a splash of comedy thrown in. Jason Kennedy started fishing at the age of three in the rivers, beaches and lakes of Gippsland Victoria. Soon his hobby became his profession with his very own TV show called Fishin' Trip which ran for 11 years across Australia. Jason's famous catchcry of STOP THE BUS can still be heard when someone is ripping into a monster fish. Fishin' Trip was great grounding for Jason to learn his craft and it taught him all that was needed to know about the television fishing industry. 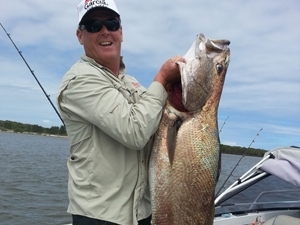 Fishing is his life and he has become one of Australia's top anglers in all genres. Jason's blend of humour and hi-jinx is a perfect match for Merv Hughes Fishing and the two of them have hit it off to make a show which is completely different to any other show out there. Brian is well versed in forms of television. The former male model has turned his knowledge of the entertainment industry to behind the scenes with his exceptional knack of camera/audio work. He is a much welcomed member of the show and a well valued commodity. Our newest addition to Merv Hughes Fishing cameraman Peter Farragher. The self taught cameraman and a master of many talents has been Jason's cameraman on Fishin' Trip for the past 10 years. With Ben, Brian and Poppy doing the lens work on Merv Hughes Fishing we have assembled some of the country's finest cameramen.